Have you ever found yourself dehydrated out on the trail and in much need of fresh water? Surrounded by lakes and rivers from which you can’t drink? The worst thing you can do is be thirsty when you’re far away from civilization. In this case, you should consider buying the best hiking water bottle to ensure that you not only have clean drinking water, but that you also have it on hand while you are hiking. When you’re out hiking, it’s important that you stay hydrated. Not counting for the heat, the exertion alone drains a lot of water from your body, and it’s important that you replenish it. Extreme dehydration can result in dizziness, headaches, dry mouth and skin, a drop in blood pressure, and in even more extreme cases, seizures and shock. However, it can be difficult to figure out which one you should go for. That’s why we are here to help! In this article, we’re going to show you the most important features you should be focusing on when buying a hiking bottle. After that, we are going to show you some reviews of the top rated products on the market. So let’s get started. Before you can start shopping for the right bottle, it’s important that you first know what you’re looking for. That’s why we’re going to explain to you the vital features to keep an eye out for, and why they’re so important. Hiking bottles can be made from just about anything, and also in a wide variety of styles. Knowing the differences between them all will help you to determine which one is most suitable for your needs. Here’s a quick rundown of the kinds that are out there. Foldable bottles: This type of a water bottle is considered to the cheapest and the most convenient. You can easily fold it when it is empty and put it in your backpack. It is a perfect option for those who want to save some space in their pack and avoid of carrying heavy bottles all the time. Usually such water containers are made of such non-toxic materials as plastic, polyethylene or silicone, which are leak-proof. They are also quite easy to clean and wash and also eco-friendly. The only one disadvantage of them is their volume: in average it is approximately 500 ml, which makes the bottle good and efficient only for quite short hiking trips. Polycarbonate bottles: They are made from a sustainable and eco-efficient material, making them light, convenient to carry, easy to load. The major advantages of plastic bottles are affordability, absence of metallic taste and ease of use. However, there are also some disadvantages, in that they are not good for hot water and other liquids, and there is still a supposition that polycarbonate bottles still have BPA toxins. Aluminum bottles: Despite the fact that they are made of metal, they are lightweight. Moreover, you should not be concerned about drops and impacts, as it is one of the most durable types of hiking bottles. Also, these bottles are perfect for the environmentally-conscious because they are environmentally-safe and easy to recycle. They also don’t rust, which means they’ll last a long time. Their only disadvantage is that they have a high cost. However, since the production of aluminum bottles is increasing now, it should not be that expensive nowadays. Stainless steel bottles: They are quite similar to aluminum bottles but have some significant differences. The main one is their higher weight, which is not ideal for some hikers. Outdoor lovers prefer these bottles due to their durability, solidity and firmness, since these qualities allow them to use the bottle not just as a reservoir but also as a weapon in case of animal attacks. Moreover, with the bottle made of steel there is no need to be concerned about toxins and other chemicals. Glass bottles: Bottles made of glass are a perfect option for those who like flavored drinks because glass does not absorb chemicals or odors. Moreover, it is considered as an ecologically clean and toxic-free material. If you buy a glass bottle, you will deal with cleaning problems since most glass models are dishwasher-safe. Concerning the disadvantages, you should know that glass is quite heavy, so a glass bottle will add weight to your backpack. The volume of a water bottle that you decide to buy depends on your level of activity. It is obvious that if you’re used to making long hiking trips, you will definitely need a bottle of a bigger volume. In general, all hiking bottles have a volume in average between 0.5 and 1 liter. However, there are some water bottles that come with purifiers or filters near the lid so that if you do run out of water, you can fill up from any water source. These filters are usually designed to remove up to 99% of bacteria and protozoa so that you can have clean drinking water anywhere you go. If you’re intending to go on a multi-day excursion, then this would definitely be the best choice for you. Do you want a bottle that you have to carry around all the time, or one that can fit in your backpack? When going on a hike, it is important to make sure that your water bottle is easily accessible. It means that you should not have to stop every time when you want to take a sip. Therefore, it is better to have a bottle that fits easily the side pocket of your backpack. As an alternative, you can buy a special hiking belt with bottle holders, or you may want to look for a bottle that provides access for clipping on a carabiner. That way, you can attach it to the zipper of your backpack so that it’s easier for you to reach. After a long hike, different organisms and microbes can start to grow in your liquid. This can lead to unsafe ingestions that can make you sick, and that’s the last thing you want when you’re far away from civilization. Intestinal distress will only make you more dehydrated in the end, and then you’re caught in a vicious cycle of illness. You should look for a water bottle that is extremely easy to clean to prevent this from happening. Thankfully, the majority of hiking water bottles are made from materials that are very easy to sanitize, such as metal, plastic, and glass. Knowing how you will use your bottle will greatly help you with narrowing your choice. Will you be using your hydration bottle for rugged backpacking trips? Or perhaps, you will mostly use it for easy hiking trips and perhaps some workout sessions? There are hiking bottles that are well-suited to a wide variety of environments and are best for general use. On the other hand, there are heavy-duty bottles that would be handy for multi-day backpacking trips. Identify your needs and then find the best bottle that best fit them. Now that we’ve provided you with the important details you need, here are some of the best hiking bottles on the market that customers keep buying time and time again. Consider the details of each product carefully, read the reviews, and consider which one(s) would fit your lifestyle the most. 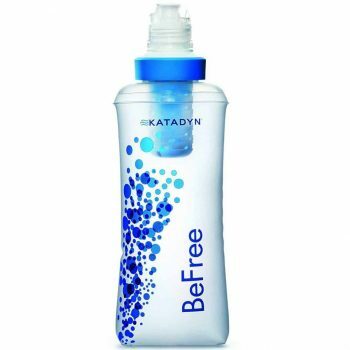 The Katadyn BeFree Water Filtration System guarantees to provide you with fresh, clean drinking water with every use. This is due to its 0.1 micron filter, which removes 99.9999% of water-borne bacteria, and 99.9% of protozoa, such as Giardia & Cryptosporidium. Due to its EZ-clean membrane, the bottle is easy to clean; all you have to do is shake it to clean the filter. That makes it easy for you to use your bottle more often, especially on particularly hot days. The bottle also allows easy hydration due to free flow channels and the wide mouth. Water flows easily through the opening, but is still secure enough that water won’t spill when you’re not using it. The wide mouth also allows the bottle to fill more quickly so you can get going on your hike instead of wasting time. Finally, the bottle is lightweight and easy to carry. It’s completely collapsible, so once your bottle is empty, you can just fold it up and stick it in your backpack. Related: When you’re in the great outdoors, you won’t have the luxury of a flushable toilet; instead of holding it in the entire time you’re there, consider bringing The Tentlab The Deuce of Spades Potty Trowel with you. It weighs as little as 0.6 ounces, comes in plenty of colours, and makes it easy for you to dig a hole deep enough to hide your number twos. 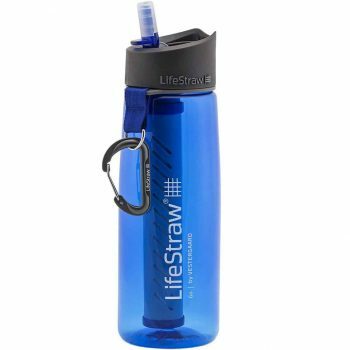 The LifeStraw Go Water Filter Bottle can remove 99.9% of waterborne bacteria and protozoa, as well as various odors and chlorine. That makes it quite popular among the outdoors and hiking crowd, especially those who take extended-day excursions. The filter itself is capable of cleaning up to 1,000 liters before it requires changing. That’s a lot of drinking water for just one person, and bringing several of these bottles with you on your trip will ensure that everyone can drink safe water. The bottle is extremely lightweight, so it’s easy to store in your backpack when you need your hands free. The silicone mouthpiece also makes this bottle leak-proof. No more lost water and having to refill sooner than you need, you can keep hiking for longer and get to your destination faster. Related: Starting a fire can be one of the biggest problems any camper can face. Kindling doesn’t always light, especially after a rainfall, and starting it by hand is tiresome. Instead, consider the Esbit 1300-Degree Smokeless Solid Fuel Tablets, which are guaranteed to light every time. You get 12 tablets that burn for up to twelve minutes at 1300 degrees Fahrenheit, which is hot enough to dry your kindling and give you a roaring fire in no time. If you’re a minimalist, who seeks the ultimate in convenience, performance and portability, GRAYL Ultralight Water Purifier Bottle is the hiking bottle for you. It’s easy to use in all conditions and environments, no matter whether you’re hiking or skiing. And you can have clean water in seconds, you just need to fill it with water, press and drink. By using it, you can be sure you are fully protected from any waterborne bacteria, viruses, protozoa, dangerous chemicals and heavy metals. Its unique purifier media contained several embedded layers of ultra-powered activated carbon by creating a big surface area for eliminating any possible toxins. In additions, the bottle has silver treated zeolites, which is a natural antimicrobial, that are able to keep the purifier absolutely fresh between uses. On top of that, one filter provides as much clean drinking water as you can get from 300 single-use water bottles, so this bottle definitely does its part to help the environment. Related: Biting insects can definitely be an annoyance, but they’re also a hazard to your health. Sawyer Products Premium Insect Repellent is effective at keeping away and killing mosquitoes, ticks, mites, and chiggers. It won’t stain your clothing and is odorless after it dries, so you’re not walking around with a chemical smell all day long. 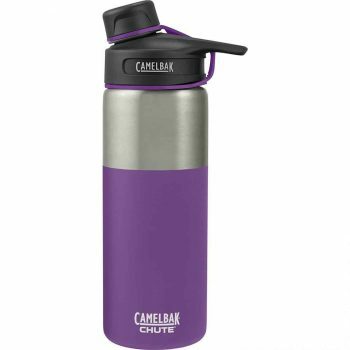 The CamelBak Chute Water Bottle is a great water container for all kinds of outdoor activities, but is especially perfect during hot summer days. Due to its vacuum insulated steel, the liquid inside will remain cold for up to 24 hours. You also do not have to worry about any leakage thanks to the bottle’s leak proof design. In addition, it is absolutely safe to use because it’s BPA/BPS -free so that there’s no undesirable flavor in your water. Every sip is just as same as the first, and will taste like it came right from your tap at home. This encourages you to drink more water so that you can stay hydrated during your hike. The stainless steel also makes it easy for you to keep this bottle clean, which is a big plus for those who take this bottle through grueling adventures. Related: No one wants to leave Fido out of the hiking festivities, but it’s important that you have some way of providing him with his meals while you’re away from home. The Ponanic Collapsible Dog Bowl is perfect, as it collapses into a disc that can fit into any pocket of your backpack. Or you can use the carabiner to clip it to the outside of your backpack. Either way, you have a safe and easy way to provide your pooch with food when he’s feeling hungry. 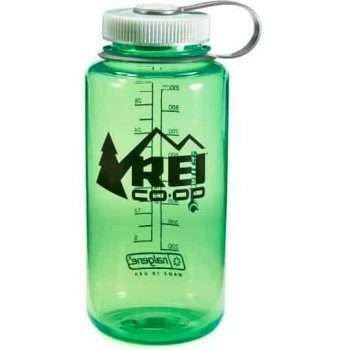 This great REI Co-op Nalgene Water Bottle is suitable for all types of outdoor and recreational activities and is a great addition to your outdoor equipment. It’s extremely lightweight so it’s easy to carry, has a very wide mouth for easy drinking and filling, and is very easy to keep clean by throwing it into your dishwasher. This bottle also has a great volume capacity, so that means you can carry more water with you on the go. It comes in green or red, making it easy for you to tell your bottle apart from others. And the copolyester material can be written on with a marker if you really need to identify which one is yours. Another great thing about this water bottle is that it’s completely BPA-free. That means no funny taste in your water after being left out in the sun too long. If that isn’t incentive enough to get you to stay hydrated, then we’re completely out of ideas. Related: When it comes to enjoying your hiking trip, you want to be able to have cold, refreshing drinks or at least have some way to store your meals so that they won’t spoil in the heat. The YETI Roadie 20 Cooler can carry up to 14 cans and only weighs about 16 pounds when it’s empty. The lid is also made to be durable, no matter how many times you open and close it. 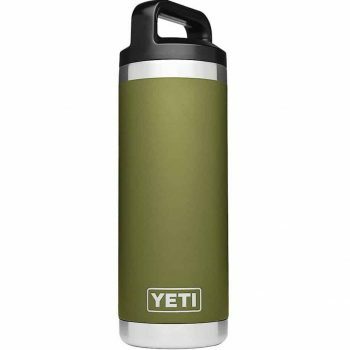 The YETI Rambler Stainless Steel Bottle was specifically designed and produced by YETI for real outdoor enthusiasts who spend much time in the wilderness. Due to its double-wall vacuum insulation, your drinks will remain either absolutely cold or hot for a long period of time, which should make your outdoor experience as comfortable as possible. This hiking bottle is also designed to be quite tough. The stainless steel can take a few falls, and still keep working. Its robust construction will survive even the most grueling hikes, so you can expect to keep this one for a very long time. 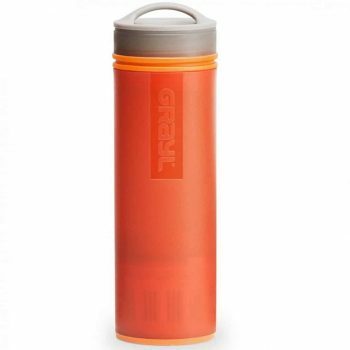 The bottle has a very convenient design with a TripleHaul cap, which makes it easy to grips while hiking. Additionally, the bottle boast a wide mouth that is preferred by most outdoor adventurers due to easier filling and adding of ice. Related: Want to bring a personal drink you don’t have to share with other people, but you’re afraid it will lose its temperature? The YETI Coolers Ramblers have you covered; each rambler holds 10 ounces of fluids, and is insulated to keep your drink at the perfect temperature. That means no more sweat marks on your favorite coffee table, whether it’s made from glass or wood. 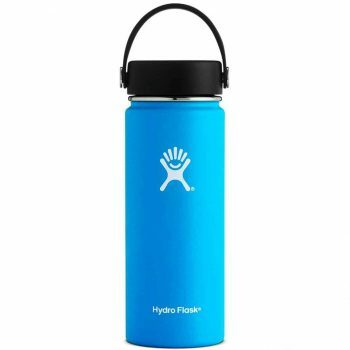 Due to the Hydro Flask Water Bottle‘s double insulation technology, the temperature will be maintained for many hours regardless of weather conditions. If you fill with iced water in the morning, you can be sure that you will still drink cold water around noon. Since it is made with stainless steel, you can expect durability, purity and strength. The steel is also available in a large number of fun colors, so you may have a hard time choosing just one. Along with color, you have three choices of sizes, depending on your daily water intake. One more useful feature that contributes to the convenient use of the bottle is its powder coat that provides sweat-free and easy grip. The loop-top also makes it easy for you to attach to your backpack with the use of a carabiner, if you have one. Related: Even after a long day of hiking, your drinking bottle could be susceptible to grime and the growth of bacteria. You can keep these away with the OXO Good Grips Water Bottle Cleaning Set, which comes with three brushes to help you with the cleaning process. They’re also great at cleaning the caps and mouth pieces of your bottles to ensure there’s no gross film the next time you use them. The choice of a water bottle depends on your own needs, preferences and conditions in which the bottle is going to be used. We hope that the reviews in this article have been useful for you and have made it easier for you to choose the best water bottle for hiking. Do you feel more confident about finding a hiking bottle that is best suited for you? So which hiking bottle would you recommend? Have a story of a product you’d like to share with us? Let us know in the comments!